All compositions by Pablo Ziegler except # 10: Astor Piazzolla, Horacio Ferrer. 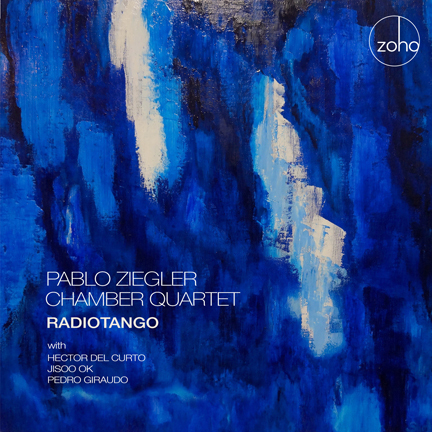 Radiotango is the latest terrific release by pianist/composer, and GRAMMY and LATIN GRAMMY winner Pablo Ziegler, an artist who been synonymous with the very best of tango music for decades. Hailing from Buenos Aires, Argentina, Ziegler is celebrated for pushing the musical boundaries of Nuevo Tango. And for good reason: He has helped to shape this very genre, beginning his career as Astor Piazzolla’s pianist, and later, composing and arranging his own works that have become standout classics. 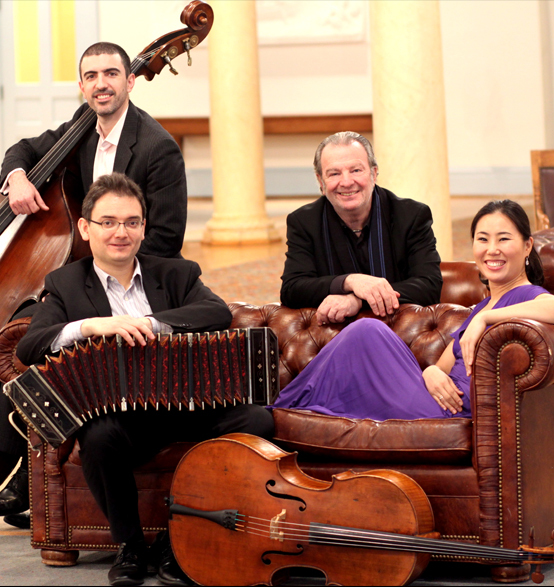 Ziegler has breathed fresh ideas into tango, adding influences of classical music and contemporary jazz to the genre, to the delight of audiences around the world. Radiotango continues Ziegler’s intrepid and ceaseless march toward adding a fresh and vibrant spirit to the music. The title track Radiotango comes from the introduction of the radio program “FM Tango” that aired in Buenos Aires in 1988 and 1989. There is no doubt that this arrangement will catch the antennas of porteños (those from Buenos Aires), with rolling lines performed by Ziegler on piano and Hector del Curto on bandoneon who joined again following Ziegler's previous 2018 Grammy-winning album “Jazz Tango”. Maria Ciudad is a deliberate milonga that was dedicated to Ziegler’s daughter Maria, whose namesake is also the original name of the beloved city: Santa Maria de los Buenos Aires. Imagine Ziegler’s music taking you to and from the obelisk at the city center, with stops in Plaza de Mayo and Teatro Colon. Asfalto establishes a propulsive ostinato that carries forth through the piece, to evoke the pitter-patter of those walking through the Bueno Aires streets. El Empedrado harkens to vintage tangos from the 1920s and 1930s. Ziegler infuses the piece with bright lines and incandescent virtuosity that we’ve come to expect from the master musician. Milonga Del Adios is akin to a farewell tribute that Ziegler composed for his late mentor and friend Astor Piazzolla who passed away on July 4, 1992. Desde Ostros Tiempos showcases Ziegler’s prowess as a composer, fusing a classic tango style with contemporary harmony and tonalities. La Conexion Porteña is also familiar number, the soundtrack of an Argentinean film that was based on the US film “The French Connection.” You’ll sense the frenetic feel of the thrilling film. Paradoxically, the movie wasn’t released because of a government ban, but the music became widely known. La Rayuela evokes a brisk milonga rhythm that has become a favorite for tango dancers. It was initially popularized in the early twentieth century. Ziegler re-arranged the cello in a more melodic way, which is performed by the incredible Jisoo Ok, over the rock-solid bass foundation provided by one of the premier bassists in tango music, Pedro Giraudo, a 2018 Latin Grammy winner in his own right. Muchacha de Boedo is Ziegler’s stirring tribute to Boedo, the iconic neighborhood in Buenos Aires, which is referenced in the lyrics of several tango songs. Upon hearing this tune, you may start to think of the bustling city life in this remarkable, urbane metropolis. Lastly, Fuga Y Misterio is an elegant fuga style which Piazzolla composed in 1960. It’s from the opera “Maria de Buenos Aires” and alludes to the time in which he studied counterpoint in Paris with Nadia Boulanger. -Kabir Sehgal is a New York Times bestselling author and Multi-Grammy & Latin Grammy Award winning author. All arrangements: Pablo Ziegler. Producers: Pablo Ziegler, Kabir Sehgal. Liner notes: Kabir Sehgal. Co-producer: Kenya Autie. Recording engineer - Hector Del Curto. Mixing/mastering engineer - Oscar Zambrano, Zampol Productions. Recording live at Palais de Glace, Vermont in 2018. Front cover from the original painting "Form of Passion" (2013) by Shoko Otowa. Photography: Masae Shiwa. Art direction and package design: Al Gold. Executive Producer: Joachim "Jochen" Becker. Special thanks from Pablo Ziegler to Masae for giving me inspiration and motivation to keep pushing this music. Publishers: Ziegler Music Publishing ASCAP (# 1  9); "Fuga y Misterio": WB Music Corp OBO Editorial Lagos/SDRM/Sadaic Latin Copyrights Inc.